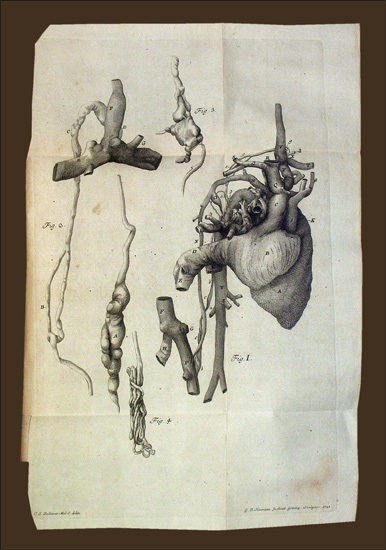 Disputationum anatomicarum selectarum. Volumen I (-VIII). Considerations on several proposals, lately made, for the better maintenance of the poor. RIMAGGIO - FAMIGLIA GIRALDI - LEGATURA ALLE ARMI]. 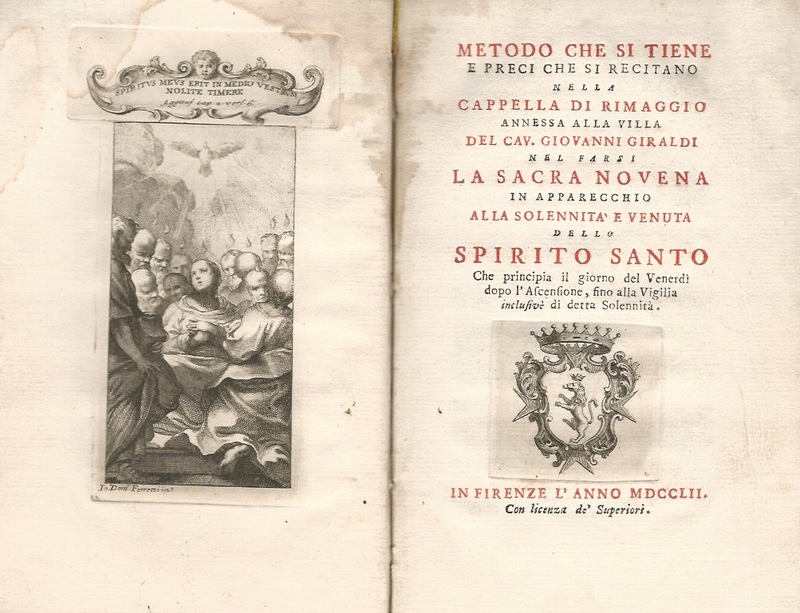 Metodo che si tiene e preci che si recitano nella Cappella di Rimaggio annessa alla villa del Cav., Giovanni Giraldi nel farsi la Sacra Novena in apparecchio alla solennità e venuta dello Spirito Santo. Euzoia, ofte Wel-Leven. Waar in het Wel-leven, in het Gemeen, het Verstandig en Gelovig Leven, In het byzonder, uitvoerig verhandelt, Waar in ook het Gebin, ende Voortgang van het Geloofs Leven, Ende het Leven door het Geloof, op de Beloften, In het breede, vertoond word. Alles geschikt, ter bevordering van een redelyk, en Evangelisch Christendom, en om door Wel-leven, tot wel, en zalig sterven, te werden voorbereid. Amsterdam, Adriaan Wor, en Erve Gerard onder de Linden 1752/1747/1751/1752/1752/1753. 6 delen, (70) 488, (86, 2) 474 (1), (151, 9) 446 (2), (82, 2) 539 (1), (113, 15) 466 (1), (24, 4) 555 (1) p. Opnieuw gebonden half Leer, 8° (Deel 1 en 4 in de originele banden, deze zijn plaatselijk gerestaureerd/beschadigd. Diverse pagina's aan de randen verstevigd, 2 pagina's deel 5 in kopie.). London: J. Payne, 1752-, 1754. Most of the imprints at the end of each number trimmed away or cropped (as often: the imprints appear very low on the page), but with decent margins throughout, signature clipped from upper corners of flyleaves; extremities rubbed, joints partly cracked but sound, generally in excellent, crisp condition.. 140 original numbers bound into two volumes, small folio; library bookplates with release stamps, small stamps on title-pages; in contemporary tree calf, spines gilt in compartments between raised bands with ornate double labels;. 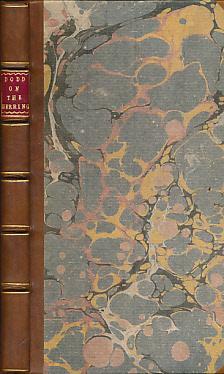 Cook's editor's influential literary periodical: the first edition, in an elegant contemporary binding. 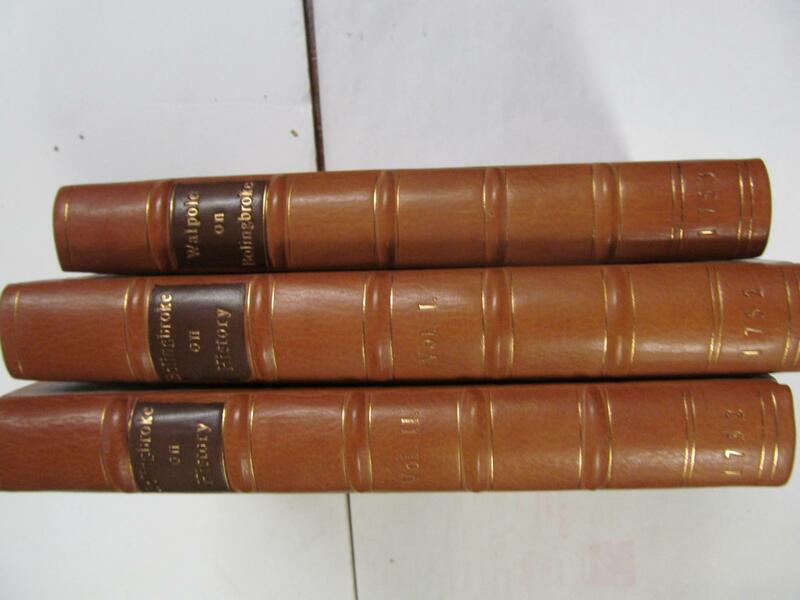 It was because of the prolific literary skills and the versatile pen exhibited in works like The Adventurer that Hawkesworth was appointed to compile the official account of the voyages, based on the journals kept by Captain James Cook and others, selling the copyright to Strahan and Cadell for the then immense sum of £6000.This is a rare complete set, in excellent condition, of this creation which was intended as a successor to Johnson's Rambler, for which he had been a major contributor; although here Hawkesworth was not only the editor and major contributor, but also the creator. He was assisted in his effort by Joseph Warton and Richard Bathurst, as well as by Dr Johnson himself, who contributed twenty-nine essays, most of which are signed "T.". Other contributors included Bonnell Thornton, Warton, Hester Mulso, George Coleman, and possibly Elizabeth Carter. It is also particularly interesting as a source of what little biographical information on Hawkesworth exists for, as John L. Abbott has shown, many of the pieces (particularly numbers 12 through 14 on "Opsinous") are strictly autobiographical in substance (John L. Abbott, 'John Hawkesworth,' Eighteenth-Century Studies, Spring 1970, p. 340).In its day, The Adventurer had a considerable success and was for example distinctly more popular than The Rambler, largely because Hawkesworth gave his audience the mixture of topics it wanted: 'an astute editor, Hawkesworth saw the folly of forcing too much criticism on a public among whom the tinsel of a burletta had more admirers than the gold of Shakespeare?' (Graham). The Adventurer is also still seen as a particularly useful text for its critical articles by Johnson as well as by Warton, who contributed twenty-four essays, ten of which 'contain notable criticism'. He reviewed Pope, 'wrote three papers on the Odyssey, two on the Tempest, one on Jewish poetry, one on Paradise Lost, one on the fragments of Menander, and two on King Lear. He thus helped to give The Adventurer a critical volume in excess of either The Spectator or The Rambler?' (Graham).This beautiful set comprises the first printings of the complete run of the 140 numbers of The Adventurer, published twice a week from 7 November 1752 until 9 March 1754. Bound up from the original numbers, it includes the corrected state of numbers 58, 84, and 137. 1752. JUAN [Y SANTACILLA], Don George, and Don Antoine de ULLOA [Y DE LA TORRE GIRAL]. VOYAGE HISTORIQUE DE L'AMERIQUE MERIDIONALE FAIT PAR ORDRE DU ROI D'ESPAGNE ... OUVRAGE ORNE DES FIGURES, PLANS ET CARTES NECESSAIRES. ET QUI CONTIENT UNE HISTOIRE DE YNCAS DU PEROU, ET LES OBSERVATIONS ASTRONOMIQUES & PHYSIQUES, FAITES POR DETERMINER LA FIGURE & LA GRANDEUR DE LA TERRE. 2 VOLUMES. Amsterdam & Liepzig: Arkstee & Merkus, 1752. First edition in French. , 554; 316, , 309,  pp. 4to., original gilt ruled calf, raised bands, gilt leather spine labels (title label detached, laid in for Vol. I). Originally published in Madrid in 1748. 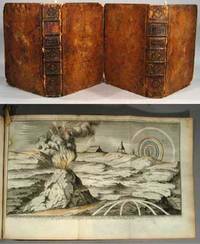 Two engraved frontispieces and 54 engraved maps, plans and views (on 53 leaves), most folding, in excellent condition. Marbled edges and endpapers. Joints cracked, leather worn, spines and corners chipped, ink annotation to top board of Volume I. Personal bookplates to pastedowns. Occasional pencil annotations. Plate VX in Vol. I has been hand-colored (volcano and aurora). Plate XXIX in Vol. II is annotated in colored pencil. Some plates are heavily offset; a few have a discreet owner's inkstamp to reverse, not showing through. Needs rebinding. Attached to a French expedition to South America organized by the Academie des Sciences, Ulloa and Juan were "two of the most scientific" officers of the Spanish Navy (Sabin); having discovered together the element platinum by 1744. The purpose of the trip was to measure the degree of longitude in the equatorial region of Peru. The second volume is largely devoted to the Incas and their culture. The work also contains the earliest reference to the "aurora australis." Verplanck Colvin's copy with his pencil notes. Verplanck Colvin (1847-1920) was a lawyer and topographical engineer whose understanding and appreciation for the environment of the Adirondack Mountains led to the creation of New York's Forest Preserve and the Adirondack Park. Sabin 36812, Cox II p. 275. Amsterdam & Leipzig: Arkste'e & Merkus, 1752. Two volumes. ,554; ,316,,,309,pp., plus fifty-five plates and maps (most folding). Quarto. 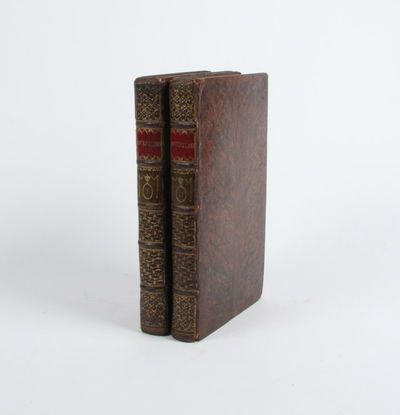 Contemporary speckled calf, spines gilt, leather labels. Hinges cracked, boards lightly worn and stained. Bookplates on front endpapers. Light scattered foxing and soiling. A good plus copy with nice wide margins. 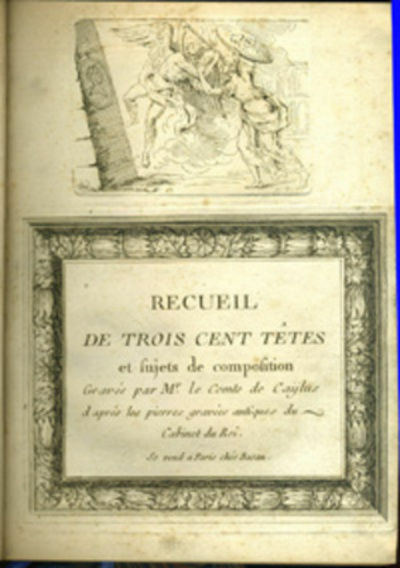 First French edition, after the original Spanish of 1747. Sabin lists the French language edition as published in Amsterdam and Leipzig, with the note: "Some copies of this French translation have the imprint, 'Paris: Charles Antoine Jombert, MDCCLII'; this has given rise to the idea that an edition was printed there, which is not the case; there is merely a change in the title. The translator was M. de Mauvillon." This voyage to Peru was undertaken due to the desire of the French government to send members of the Academy of Sciences to measure a degree of longitude in the equinoctial countries of Peru. To share in the honor the King of Spain sent along his two most scientific-oriented officers, Ulloa and Juan. The text is illustrated with handsome engraved plates and maps of the region and the inhabitants. Much of the second volume is devoted to the Incas and their customs. COX II, p.275. HILL 1740. PALAU 125479. MEDINA 3464. FIELD 1587. SABIN 36812. BORBA DE MORAES, p.873 (ref). Paris: Chez Charles-Antoine Jombert, 1752. First edition in French. Black calf, rebacked with black morocco, over marbled boards, five raised bands, two compartment lettered in gilt. Very good copies, boards rubbed, spines worn with a small chip to the rebacking, scattered foxing, and a few of the later scientific plates browned, otherwise impressions quite sharp.. [xxii], 554; [ii], 316, [vi], [viii], -309, [iii] pp. p. 238 misnumbered 338. Illus. with two engraved frontispieces, 54 engraved maps, plans, and scenes (most folding) on 53 sheets; plus engraved title vignettes and head and tail pieces. Engravings by Frans de Bakker, François Morellon La Cave, Jacob Folkema, Duflos, Title in red and black; engraved title vignettes. 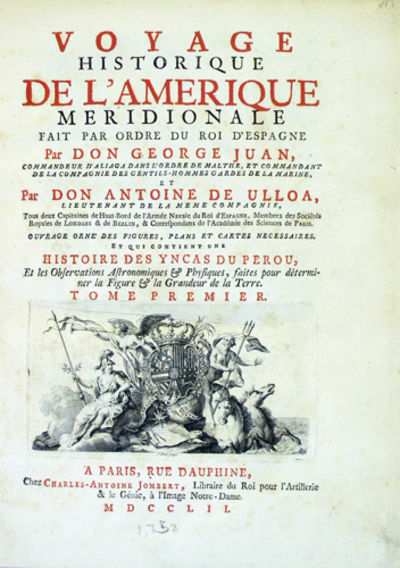 Translations by E. de Mauvillon of Ulloa's "Relacion historica del viage a la America Meridional," and of the companion work by Jorge Juan y Santacilia, entitled, "Observations astronomicas y physicas hechas de orden de S. Mag. en los reynos del Per?" 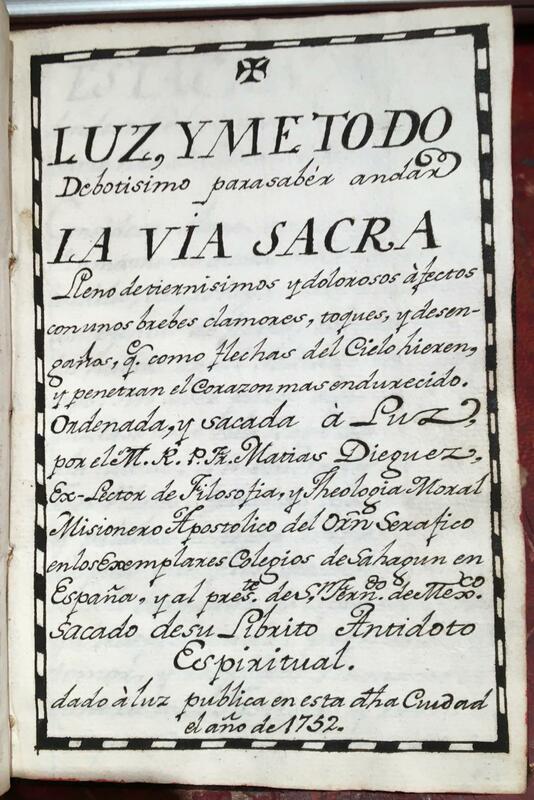 (both published at Madrid in 1748); and of Garcilaso de la Vega's "Comentarios reales de los Incas." This copy with the Paris imprint, but Sabin argues it is just a change to the title page of the Arkste's & Merkus edition (Amsterdam et Leipzig) the same year. In 1735 the French Academy of Science requested permission to send an expedition to the equatorial regions of Spanish controlled South America in order for Charles de la Condamine and other French scientists to measure several degrees of meridian at the equator. By comparing their results with those obtained by a similar mission to Lapland, the Academie hoped to settle the controversy between the Newtonians and the Cartesians over whether the earth was flattened or elongated at the poles. Ulloa and Juan y Santacilia, Spain's best scientific officers, were sent along. Despite great difficulties, the expedition's geodetic measurements proved the validity of Newton's hypothesis. Antonio de Ulloa y de la Torre-Girault (1716 -1795) was later the first Spanish governor of Louisiana though he was deposed in 1768 after two years, during a creole revolt and also served as governor of Huancavelica in Peru. Palau 125473. Sabin 36812. JCB III: 974. Medina BHA: 3464. LCP. Afro-Americana: 5409. Hill 1740.
à Paris: Chez Durand, Pissot, 1752. Fine. Chez Durand, Pissot, à Paris 1752, in-4 (19,5x26cm), (4) lv (1), 629pp. (3), relié. - First edition, translated by Baron d&#39;Holbach German, illustrated frontispiece of 1 and 15 folding plates on cuivre.Plein Calf time. Back tooled raised. Part of title in red morocco. Flush caps with headbands apparent. The lower jaw flat head split in the first two boxes. Scuffs with gaps on upper cover. 2 corners bumped. Part of title refaite.Compilation of several books on glassware collected and translated by Baron d&#39;Holbach (his preface shows the different authors), including the important treaty Neri (1612) who published for the first time how to make colored glass, crystal glass ... Neri&#39;s book was the basis and foundation for all the books that followed on the same subject. It will be observed between the various notes and treated, the Henckel &#39;s on how to use plants in the manufacture of glass, and ceui anonymously on the secrets of true porcelain. Finally we distinguish many recipes in the margins of glass art, including that of cobalt blue, but as regards metals, with the manner of brown iron, copper, silver, tan, how of produced colors, dyed black a red horse ... Bookplates manuscript De Montmirail. In 1806. --- Please note that the translation in english is done automatically, we apologize if the formulas are inaccurate. Contact us for any information! - [FRENCH VERSION FOLLOWS] Édition originale, traduite par le baron d'Holbach de l'allemand, illustrée d'un frontispice et de 15 planches dépliantes sur cuivre. Reliure en plein veau d'époque. Dos à nerfs orné. Pièce de titre en maroquin rouge. Coiffes arasées avec tranchefiles apparents. Mors du plat inférieur fendu en tête sur les deux premiers caissons. Epidermures avec manques sur le plat supérieur. Deux coins émoussés. Pièce de titre refaite. Compilation de plusieurs ouvrages sur la verrerie rassemblés et traduits par le Baron d'Holbach (sa préface présente les différents auteurs), notamment l'important traité de Neri (1612) qui publia pour la première fois la manière de fabriquer des verres de couleur, du verre de cristal... L'ouvrage de Neri servit de base et de fondement à tous les livres qui suivirent sur le même sujet. On remarquera, entre les divers notes et traités, celui d' Henckel sur la façon d'utiliser les plantes dans la fabrication des verreries, et ceui anonyme sur les secrets de la vraie porcelaine. Enfin on distinguera de nombreuses recettes en marge de l'art du verre, notamment celle du bleu de cobalt, mais aussi ce qui concerne les métaux, avec la manière de dorer le fer, le cuivre, l'argent, de bronzer, la façon de produite des couleurs, de teindre en noir un cheval roux... Ex-libris manuscrit De Montmirail. 1806. s.l. : S.n., 1752. Fine. S.n., s.l. 1752, In-12 (10x16,2cm), relié. - New edition after the original appeared in 1749. Binding full fair calf iced contemporary. Back with nerves decorated. parts of title and volume number in red morocco. 4 corners bumped, a trimmed. Volume II slightly threadbare tail. Friction. Pretty nice copy. British Foreign affires - [FRENCH VERSION FOLLOWS] Nouvelle édition, après l&#39;originale parue en 1749. Un portrait au frontispice. Les réflexions sur l&#39;exil possèdent leur propre page de titre, dans le volume I, tout comme la Lettre à Mylord Bathurst dans le second. Reliure en plein veau blond glacé d&#39;époque. Dos à nerfs orné. Pièces de titre et de tomaison en maroquin rouge. 4 coins émoussés, un rogné. Tome II légèrement élimé en queue. Frottements. Assez bel exemplaire. Secrétaire d&#39;état, puis Ministre anglais des affaires étrangères, Lord Bolingbroke fut un homme état influent qui connut la notoriété et la disgrâce. Il mena parallèlement à ses activités politiques une carrière dans les lettres en commençant par participer à l&#39;écriture du journal The examiner (contre le parti des Whigs). Les 2 volumes rassemblent les oeuvres philosophiques de l&#39;auteur, lesquelles auront une durable influence sur des philosophes comme Pope ou Voltaire, ou bien encore Mirabeau. Sa philosophie est héritée de Locke, et l&#39;auteur se montre dans ses écrits anti-clérical et anti-religieux, mais déiste. On trouve dans le second volume une oeuvre historique sur l&#39;état de l&#39;Europe avant le traité d&#39;Utrecht dont Bolingbroke fut un des artisans. Ex libris : Bibliothèque de Belay. Catalogue d'un cabinet de diverses curiosités contenant une collection choisie d'estampes, de desseins, de tableaux & une suite unique de petits portraits de personnages illustres qui ont vécu depuis plus de trois siècles, & dont plusieurs sont peints en émail, par le célèbre Petitot : la vente s'en fera en détail, au plus offrant & dernier enchérisseur le lundi 27 novembre 1752, & jours suivants, sans discontinuation à deux heures de relevée, dans une des salles des Grands Augustins, par les Sieurs Helle & Glomy. 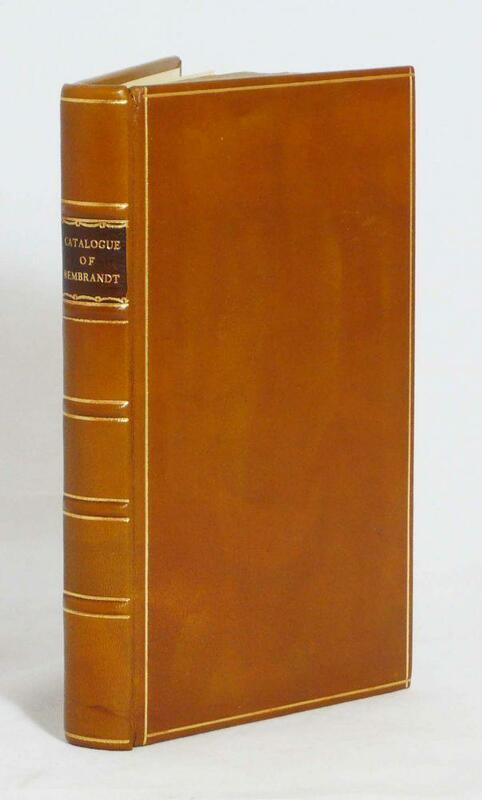 Veuve Delormel et fils, Paris 1752 - 1 vol. in-12 de (4)-88-(7) pp., demi-maroquin rouge à coins, dos à nerfs, tranches dorée (Belz-Niédrée). Les 992 lots de cette énorme collection furent vendus au cours de 20 vacations du 27 novembre au 22 décembre 1752. Selon le Getty Provenance Index Databases, le vendeur était le banquier parisien Jean Cottin (1680-1745), de la banque Cottin Frères. Conlon 52:706. Paris. Hardcover. Very good+. These are engravings from the original plates, some of which are lightly colored by hand. 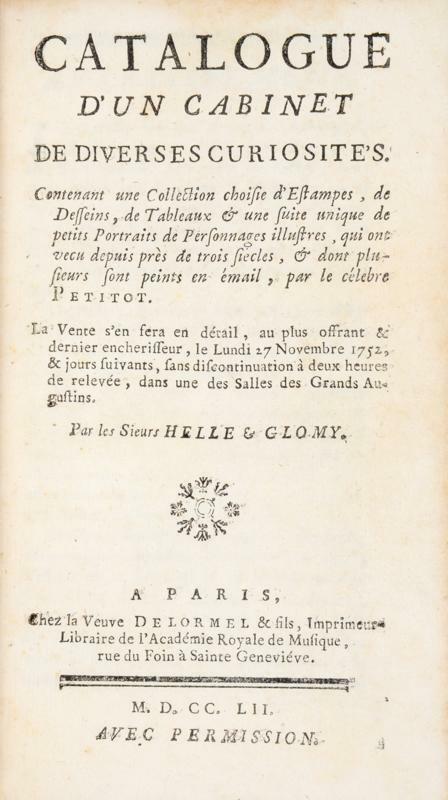 The Preface makes mention of M. Mariette and M. Bouchardon. The Comte de Caylus was an eighteenth century archeologist and man of letters whose interest in classical antiquity and whose work of 1752- 1755 (Recueil D'antiquites Egyptiennes, Etrusques, Grecques, Romaines et Gauloises), was an important source for French neoclassical artists. 8vo, 300 b&w engravings, preface (i) in French. Titles to engravings in French. Marbled boards, modern leather, half calf. Gilt title on spine with author's name above, and title below, both in gilt. 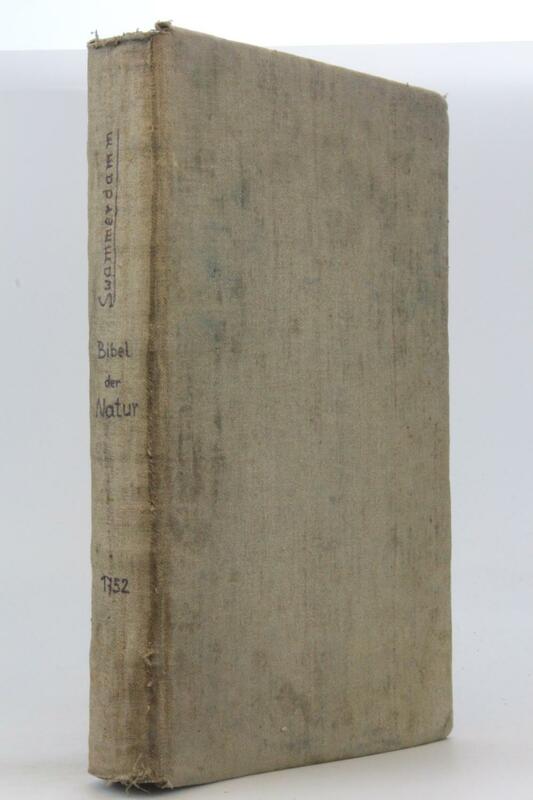 Spine is rubbed so that gilt on author's name has faded. Gilt is rubbed on title, but still legible. La Divina Commedia di Dante con gli Argomenti, Allegorie, e Dichiarazioni di Lodovico Dolce. Aggiuntovi La vita del Poeta, il Rimario, e due indici utilissimi. SULZER, Wolfgang Jakob (1685 - 1751)., Hüftbild en face des vierunddreißigsten Bürgermeisters von Augsburg, stehend vor Draperie, mit der Rechten auf Urkunden weisend, rechts Ausblick auf das Augsburger Rathaus, unten Wappen und Inschrift. Florence: Viviani, 1752. FIRST EDITION. A large folding plate depicting a solar eclipse, woodcut initials, head- and tailpieces. Contemporary paste-boards. An excellent copy. 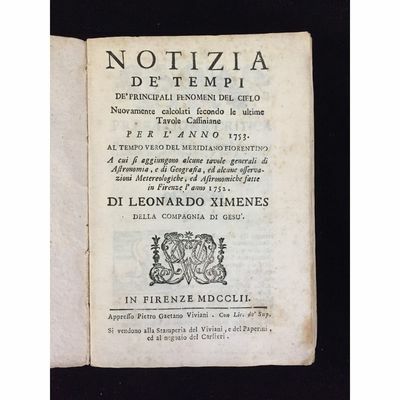 First edition of Ximenes' astronomical observations according to Cassini's tables to determine the solar ecliptic longitude. This was Ximenes' first published work. His observations were recorded in Florence during the years 1752-1753 and described the solar eclipse of October 26, 1753 in twenty-two different European towns. The solar eclipse of 1753 Oct 26 was a rare hybrid solar eclipse in which the eclipse path starts out as annular; further down the track it changes to total and then back to annular before the path ends. Of interest, it was preceded two weeks earlier by a partial lunar eclipse on October 12, 1753. Ximenes (1716-1786) was an Italian mathematician, engineer, astronomer and geographer. In 1756, he founded the observatory of St. John in Florence (now named after him, the Ximenian Observatory). He is also known for having restored the fifteenth-century gnomon in the dome of Santa Maria del Fiore in Florence which he used to conduct his astronomical and physical observations. Rare; OCLC locates 1 copy in America (Oklahoma) and 3 copies in Italy. The Principles of Politic Law: Being a Sequel to the Principles of. 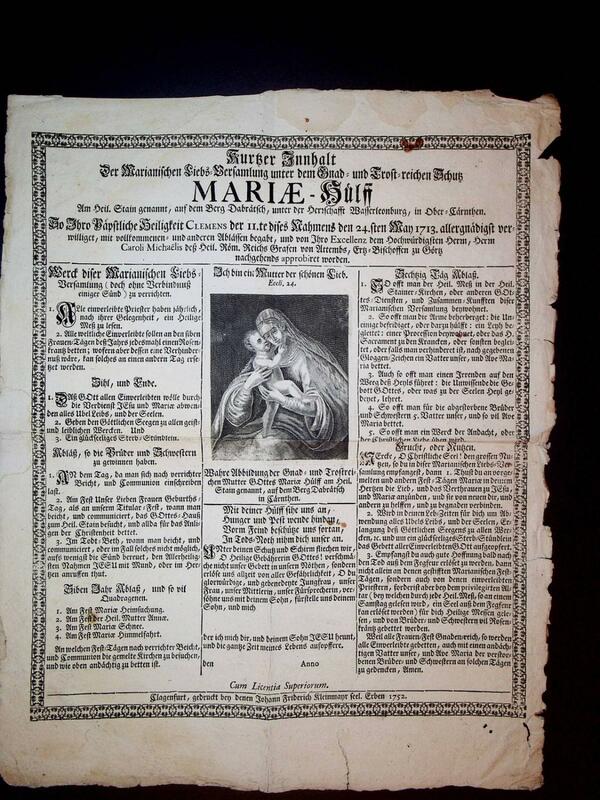 DOBRATSCH- Einblattdruck die Kirche Maria am Stein oder Deutsche Kapelle Titel: Kurtzer Innhalt Der Marianischen Liebs-Versammlung unter dem Gnad-und Trost-reichen Schutz Mariae-Hülff Am Heil. Stain genannt, auf dem Berg Dabrätsch, unter der Herrschaft Wasserleonburg etc. Joseph Naylor, [c.1752]. 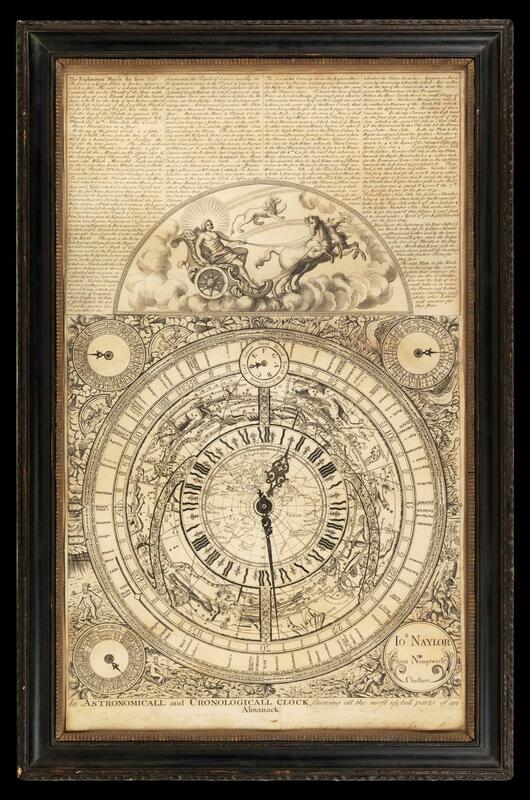 - A previously unrecorded state of a rare promotional broadside for an astronomical clock Separately published broadside engraved map. John Naylor was one of an important school of clock-makers based in Nantwich, Cheshire, active from about 1725. By about 1740 he had relocated to London, and seems to have died there in 1752.It seems likely that, in about 1726, he designed a series of engraved metal plates that could be used to make a clock face, such as the example in the British Museum. In parallel, he must have published a second, near identical clock face, to be used as a promotional broadsheet for the clock, or as an instructional guide to the uses of the clock. While virtually identical, the promotional version has engraved hands over the face of the clock, so it could not be used to make up a working clock face, as the owner would have the mechanical, rotating hands and the engraved hands of the print.As he was principally a clockmaker, rather than a mapmaker, it is perhaps no surprise the geography is outdated. In fact, the cartography is largely based on John Carteâ&#128;&#153;s astronomical clock of circa 1700; this would suggest that the engravings were first made in the early part of Naylorâ&#128;&#153;s career, reinforced by the Nantwich address used, but no example of the broadsheet datable to this period has been traced and, until such an example has been found, this first state must be speculative (but likely).The British Museum has the first state of this promotional engraving, with the text at the top commencing â&#128;&#156;The explanation March the first 1725/6 .â&#128;&#157;, which was acquired with their example of the clock.The British Museum also has a second state of the complete promotional engraving, with the text at the top revised, with the text commencing â&#128;&#156;The explanation March the first 1750/1 .â&#128;&#157;, evidently published to coincide with, and capitalize on, the British change-over from the Julian to Gregorian calendar. The British Library example is of the clock only, lacking the Sun god engraving and text.This example is the third state, with the Christian name in the imprint revised from â&#128;&#152;Jo.nâ&#128;&#153; to â&#128;&#152;Jos.pâ&#128;&#153; ( John Naylorâ&#128;&#153;s successor Joseph Naylor), apparently also in 1752, and with the hand of the various dials in the border re-aligned.Joseph Naylor seems not to have been a clock-maker, but seems to have inherited a finished clock. In time-honoured fashion, he planned a lottery to maximise his profit on the inheritance. There is an accompanying booklet to launch the lottery entitled â&#128;&#152;An explanation of an Astronomical Clock .â&#128;&#153; and, presumably, he re-engraved the broadsheet at the same time. 629 by 385mm (24.75 by 15.25 inches). Map border: 125 by 126mm; clock: 351 by 355mm; frame: 375 by 382mm; Widest: 629 by 385mm. Die redende Thiere über menschliche Fehler und Laster bey ruhigen Stunden lustig und nützlich zu lesen. 8. Frankfurt u. Leipzig 1759-1763. Enth. : Zehendes Gespräch zwischen einem Raben und einer Hauß-Otter. 4. Aufl. Gest. Frontisp., 110 S. (S. 97-110 Ausriss d. unteren Blattecke mit etwas Textverlust). Eilftes Gespräch zwischen einem Eichhörnlein und einer Turtel Taube. (Bei Frontispiz u. Titelblatt untere Blattecke ausgerissen, daher Impressum unleserlich). Gest. Frontisp., 78 S. Zwölftes Gespräch Zwischen Einem Lamm und Einer Biene. Frankfurt u. Leipzig 1752. Gest. Frontisp., 80 S. Dreizehendes Gespräch zwischen einem Meer-Schweinel und einer Aglaster. 4. Aufl. Frankfurt u. Leipzig 1763. Gest. Frontisp., 78 S., Vierzehendes Gespräch zwischen Einem Ziegenbock, und Einem Pfau. 4. Aufl. Franckfurt u. Leipzig 1756. Gest. Frontisp., 118 S. Funfzehendes Gespräche zwischen Einem Igel und Einer Gans. 2. Aufl. Frankfurt (Druckfehler: Franckfure) u. Leipzig 1750. Gest. Frontisp., 125 S. Sechzehendes Gespräch zwischen Einer Ameiße und Einem Holtz-Wurm. Franckfurt u. Leipzig 1759. Gest. Frontisp., 134 S. Sieben- und achtzehendes Gespräch zwischen Einer Fledermauß, und Einer Nacht-Eule. 4. Aufl. Frankfurt u. Leipzig o. J. Gest. Frontisp., 102. S. Lederband d. Zeit, mit rahmenförmigen Streicheisenlinien a. d. Einbanddeckeln u. schwarzgeprägter Beschriftung, Schnitt rotgefärbt, berieben, rechte obere Ecke d. Vorderdeckels stärker bestoßen, Leder am unteren Kapitale etw. abgelöst, mit Fehlstellen infolge Wurmfraß, Seiten großteils etw. gebräunt, erstes Frontispiz u. Titelblatt teilw. lose, einige Blätter randrissig. Mit Besitzvermerken v. alter Hand am vorderen fliegenden Vorsatzblatt u. vorderen Frontispiz verso, hinterer Innendeckel mit Zahlen v. alter Hand bekritzelt. GV 117,200. Hayn-Gotend. VII,633f. Meusel: Verst. Schriftsteller 11,281f. - R. (1716/17-1174), ein guter u. fleißiger Jurist, der sich jedoch einige Unregelmäßigkeiten u. Betrügereien zu Schulden kommen ließ, die ihm sogar Gefängnisstrafen eintrugen, war zudem ein fleißiger Schriftsteller, als "philosophischer u. witziger Kopf" mit Talent zur Satyre, verfasste er, meist anonym oder unter Pseudonymen, eine große Zahl von Schriften. Ebenfalls teilw. von ihm verfasst sind die, in 43 Stücken u. verschiedenen Auflagen 1745-1761 erschienenen, kulturhistorisch interessanten, "Redenden Thiere". Vorliegende 10-18. "Gespräche" sind komplett, mit allen (das tägl. Leben d. Zeit anschaulich illustrierenden) Frontispizen vorhanden. Allgemeine Historie der Reisen zu Wasser und Lande; oder Sammlung aller Reisebeschreibungen, welche bis itzo in verschiedenen Sprachen von allen Völkern herausgegeben worden, und einen vollständigen Begriff von der neuern Erdbeschreibung und Geschichte machen; Worinnen der wirkliche Zustand aller Nationen vorgestellet, und das Merkwürdigste, Nützlichste und Wahrhaftigste in Europa, Asia, Africa und America, in Ansehung ihrer verschiedenen Reiche und Länder; deren Lage, Größe, Grenzen, Eintheilungen, Himmelsgegenden, Erdreichs, Früchte, Thiere, Flüsse, Seen, Gebirge, großen und kleinen Städte, Häfen, Gebäude, u.s.w. wie auch der Sitten und Gebräuche, der Einwohner, ihrer Religion, Regierungsart, Künste und Wissenschaften, Handlung und Manufacturen, enthalten ist; Mit nöthigen Landkarten nach den neuesten und richtigsten astronomischen Wahrnehmungen ... Durch eine Gesellschaft gelehrter Männer im Englischen zusammen getragen. Zehnter Band. Inledning til mecaniken och bygningskonsten, jämte en beskrifning öfwer åtskillige af framledne commerce-rådet och commendeuren af kongl. Nordstjerne-orden hr. Polhem opfundne machiner. Sthlm, P. J. Nyström, 1752. 4:o. (8),183,(1) s. & 30 utvikbara grav. plr. Med två grav. vinjetter av Floding på titelbladet respektive s. 65. Samtida stänkdekorerat skinnbd med upphöjda bind, svartpressad ryggdekor och beige titeletikett. Röd- och blåstänkta snitt. Något nött rygg. Pärmarna med några ytliga skrapskador. Mycket fin och i princip fläckfri inlaga. Liten fuktfläck på yttre snittet på s. 41-48. Y-arket, s. 169-76, lätt bruntonat som vanligt. Plansch 3 med liten lagad reva och fläck i yttermarginalen, plansch 14 felbunden efter plansch 15 och plansch 17 felbunden efter plansch 26. En oidentifierad samtida prydlig stpl i titelbladets övre hörn. Fint ex. Byggnadskonsten avhandlas på sidorna 65-104. Planscherna är numrerade I-XXVIII. Av "Tab. XV" finns två planscher, den ena med tillägget "pag 167", den andra numrerad XV+. Det finns även två planscher numrerade "Tab. XVI", den ena av dessa har sidhänvisningen "Pag: 167". Carl Hindrich König (1726-1804) var elev till stadsarkitekten i Stockholm Johan Eberhard Carlberg, som han efterträdde 1773. Han var ämnessven i Vetenskapsakademien 1745 och undervisade vid Carlbergs privata arkitektskola samt ska ha arbetat för Polhem. Boken "kan betraktas som en rådgivare för unga arkitekter i sådana väsentliga ting som t ex hållfasthetslära o materialkunskap" enligt "Svenskt biografiskt lexikon" som också nämner att i "de teoretiska avsnitten, stödjer K sin framställning på Blondels Cours d'architecture". Den del av verket som beskriver Polhems mekaniska uppfinningar tillkom som en följd av ett beslut i Vetenskapsakademien 1744 om att sprida kunskap rörande dessa. Tanken var att Augustin Ehrensvärd skulle ha överinseende över projektet. Considerations on several proposals, lately made, for the better maintenance of the poor. 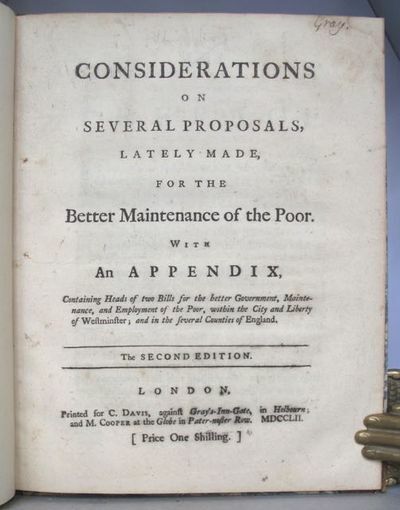 with an appendix, containing heads of two Bills for the better government, maintenance, and employment of the poor, within the City and Liberty of Westminster; and in the several counties of England. The second edition. London, C. Davis and M. Cooper. 1752. 4to., vi + 33 + (1)pp., well bound in early 20th century half roan over marbled boards. A fine, crisp, copy. Charles Gray (1696-1782), the Colchester lawyer, politician, and antiquary, here published substantial criticisms to the schemes on the poor laws of Hay and Fielding which Gray thought involved far too great a charge on the County rate. He preferred to be able to rely on voluntary contributions together with the complete disestablishment of the parish and the substitution of areas of administration. [See Beatrice & Sidney Webb, The Old Poor Law,> p.268]. 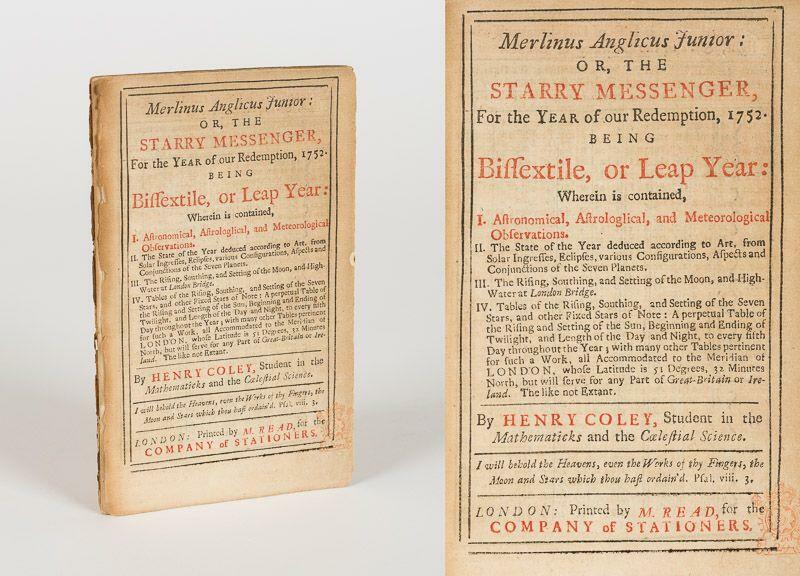 Merlinus Anglicus Junior: Or, the Starry Messenger, for the Year of Our Redemption, 1752. Being Bissextile, Or Leap Year: Wherein is Contained, I. Astronomical, Astrologlical, and Meteorological Observations. II. The State of the Year Deduced According to Art, from Solar Ingresses, Eclipses, Various Configurations, Aspects and Conjunctions of the Seven Planets. III. The Rising, Southing, and Setting of the Moon, and High-Water at London Bridge. IV. 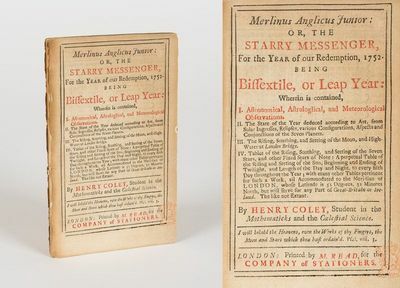 Tables of Rising, Southing, and Setting of the Seven Stars, and Other Fixed Stars of Note: A Perpetual Table of the Rising and Setting of the Sun, Beginning and Ending of Twilight, and Length of the Day and Night, to Every Fifth Day Throughout the Year ; with Many Other Tables Pertinent for Such a Work, All Accommodated to the Meridian of London, Whose Latitude is 51 Degrees, 32 Minutes North, But Will Serve for Any Part of Great-Britain Or Ireland. The Like Not Extant. By Henry Coley, Student in the Mathematicks and the Coelestial Science. (The Marine Counterparts to HomannÂ’s Elephant, Rhino and Crocodile Broadsides: the Whales, the Saw-Fish and the Narwhale). - Historia Animantium marinorum iconographica [...] Abbildliche Geschichte der See-Thiere, und zwar derselben I. besondere Vorstellung, in welcher die Walfische nach ihren Arthen, Figur [...] vor Augen gestellt werden. & II. Vorstellung, in welcher eine Art Walfische, nebst ihren zwey Feinden, dem Seege Fisch und Narwal zu sehen sind. Nuremburg, Homann Heirs, no date on first leaf, the second dated 1752.. Handcoloured copper engraved broadsides. I. 20.5 x 23.5 inches, II. 19.5 x 21 inches. Professionally restored and laid down on old paper for the purpose of reenforcing the fragile paper structure. Some previous storage folds still visible but undisturbing, some light browning to paper in places. First edition, very rare. Â– Nissen, ZBI 1990. Together with the three separately published broadsides on terrestial animals (elephant, rhino and crocodile Â– see Nissen, ZBI 1989 for the rhino) which were grouped under the collective title Â‘Abbildliche Geschichte der ausländischen LandthiereÂ’, the offered broadsides, published separately as well, form their marine counterparts. 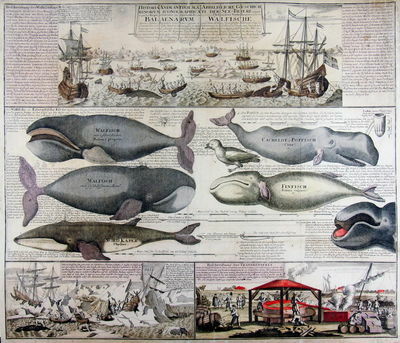 They illustrate the natural history of some species of whales and other curious marine animals and were directed to an audience which on the one hand Â– at least in Central Europe Â– neither had the chance to see these animals in nature nor in travelling menageries or game reserves, but on the other hand was well aware of them because of body parts and sometimes even whole skelletons were commonly kept in pharmacies, kunstkammers and natural cabinets. While these naturalia so oftenly became part of an exotic-folklore phantasy, HomannÂ’s broadsides were one of the first attempts to provide a scientifically more accurate knowledge of them to the wider public. - Wall map. Engraving with original outline color. Linen backed. Image measures 38.5 x 37.5 inches. 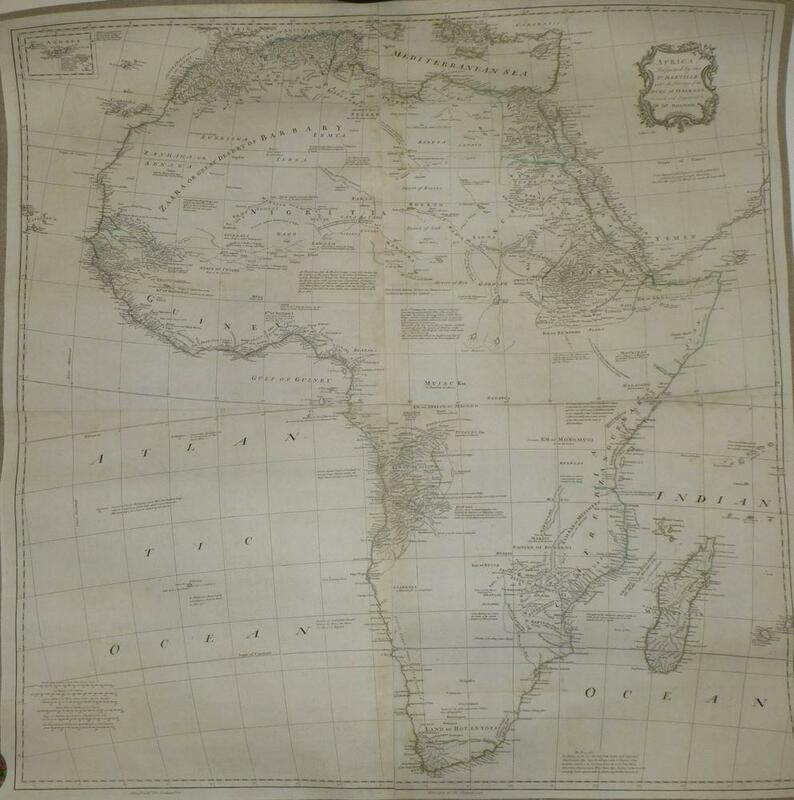 This beautiful large scale map of Africa is from Malachy Postlethwayt's The Universal Dictionary of Trade and Commerce and represents the glory days of British colonialism and seamanship. Comments are in a conversational format throughout the map. For example, a comment near Ascension Island in the Atlantic says that it was a place English mariners left their letters in corked bottles. 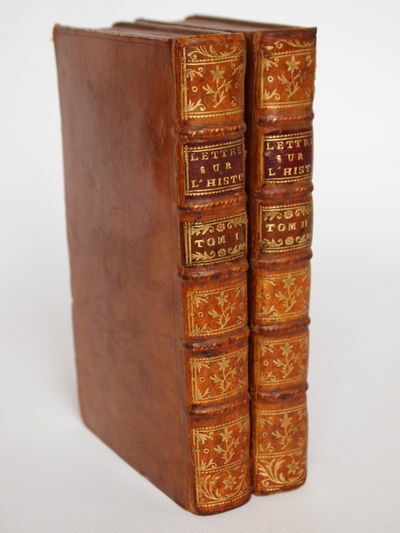 Edition is undetermined; there were four official editions of Trade and Commerce: 1752, 1755, 1766, 1774. Engraved by Emanuel Bowen. Good condition but original color outlining is faint. Mounted on linen. The obscure 18th century cartographer Mr. Bolton may also be referred to as Solomon and this is one of the maps Tooley's attributes to him. ANDAMENTO DEL TESINO E DEL GRAVELLONE A PAVIA COL PROGETTO DELLA RETTIFILAZIONE DI TESINO AL DI SOPRA DI QUEL GRAN PONTE ESPOSTO IN MIA RELAZIONE. SONNENUHREN - PENTHER, Johann Friedrich. Gnomonica fundamentalis & mechanica worinnen gewiesen wird, wie man sowol gründlich, als auf mechanische Art, allerhand Sonnen-Uhren regulaire, irregulaire, mit Minuten und himmlischen Zeichen, auf allerhand Flächen.verfertigen solle. Wozu noch eine neue Invention einer Universal-Sonnen-Uhr kommt. Acts of the General Assembly of the Province of New-Jersey . 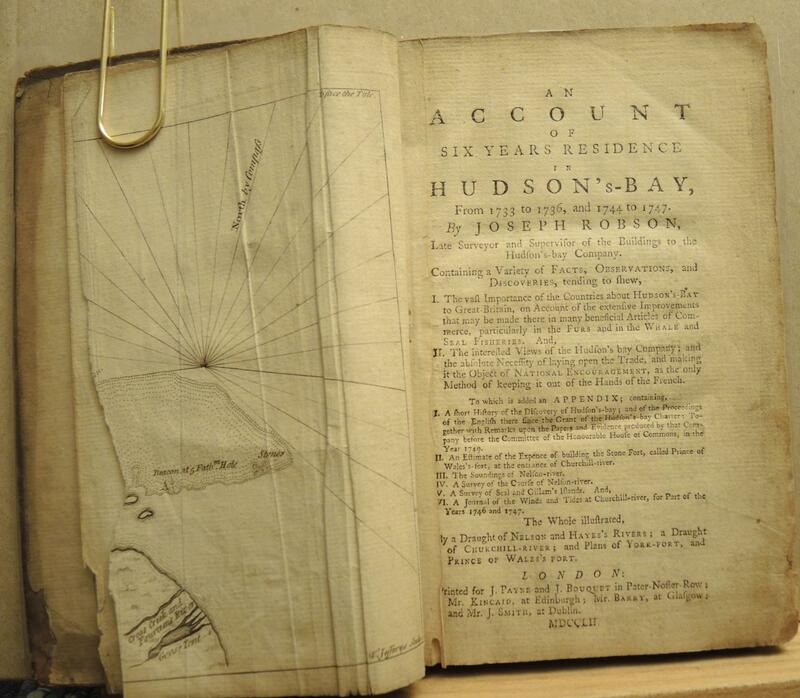 AN ACCOUNT OF SIX YEARS RESIDENCE IN HUDSON'S BAY, from 1733 to 1736, and 1744 to 1747 . NERI - MERRET - KUNCKEL. 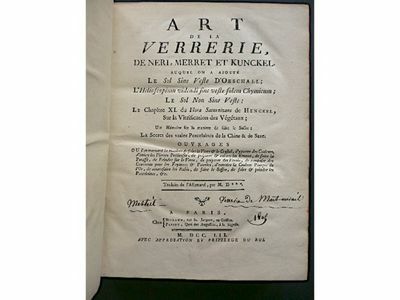 Art de la Verrerie, de Neri, Merret et Kunckel. Auquel on a Ajouté le Sol Sine Veste d'ordschall; L'Elioscopium videndi sine veste solem Chymicum; Le Sol Non Sine Veste; Le Chapitre XI du Flora Saturnizans de Henckel, Sur la Vitrification des Végétaux; Un Mémoire sur la maniere de faire le Saffre; Le Secret des vraies Porcelaines de la Chine e de Saxe. Trduits de l'Allemand. Durand Pissot, 1752. In 8°, p. pelle, pp. LV + 629 + 4 piccole ill. nn. nel t. + 16 inc., ripiegate, n. f. t. , una delle quali in front. Fregi e lettere al d. in o. L'esempl. 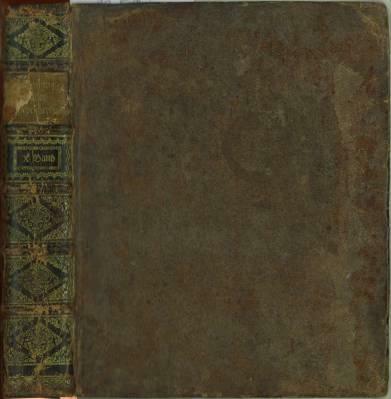 è riportato sul "Manuel du libraire et de l'amateur de livres" di Jacques Charles Brunet del 1863 (v. 4° vol., col. n. 41). Bibel der Natur... Leipzig, Gleditsch, 1752. 4 Bll., XII S., 1 Bl., 410 S., 7 Bll. (Register). Mit gestoch. Titelvign., 2 Textvign. und 53 gefalt. Kupfertafeln von J.C.G.Fritzsch. Folio. Gold- und blindgepr. Ldr. d. Zt. mit RVerg. und goldgepr. RTitel (etw. bestoßen, kl. Fehlstelle). Entdeckte Geheimniße der Zauberey zur Aufklärung des Volks über Aberglauben und Irrwahn. Geschrieben von dem Hofrath Eckartshausen. Mit 4 Kupfern und 2 Vigneten. Erstausg. 6 Bll., 271 S., mit gest. Frontispiz, 3 Kupfertaf. u. 2 gest. Vignetten, Kl.-8, Halbleder d. Zt. mit Rückenschild Faivre 57 Grässe S. 92 Hayn-Gotendorf III,192. - Die Kupfer zeigen: Hexerey Zauber-Knödel Ankunft auf dem Blocksberg Hexenfeier Schatzgräberey u. Zauberutensilien. - Karl von Eckartshausen (auch Carl, 1752-1803), ein illegitimer Sohn des Grafen Karl von Haimhausen. Wurde 1776 Hofrat, 1777 Mitglied der Bayerischen Akademie u. war von 1780 bis 1793 Bücherzensurrat. In dieser Zeit hatte er sich dem Orden der Illuminaten angeschlossen, deren wissenschaftliche u. humanistische Theorien von Eckartshausen schätzte. Der späterer Kenner u. Vertreter rosenkreuzerischen Ideengutes war zugleich aber auch Überwinder des Geheimbundwesens seiner Zeit. Bekannt sind v.a. seine "Aufschlüsse zur Magie". - Leicht berieben u. bestossen Titel mit sehr kl. Rundstempel wenige Seiten leicht fleckig, sonst ein gutes Expl. mit einem zusätzlichen, im Vorsatz montierten Stich. 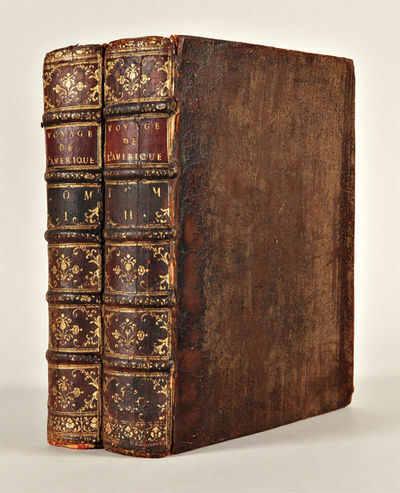 David lâ€™AinÃ© Libraire, 1752. 4to (cm. 21,5), XLVI-212 pp. con 2 tavv. rip. f.t. Fregi e capilettera n.t. Legatura coeva in pelle maculata con nervi, ricchi fregi e titolo oro su tassello al ds. Tagli rossi. Carte di guardia marmorizzate. Minimi restauri agli angoli e alle cuffie altrimenti esemplare in ottimo stato di conservazione. Edizione originale, molto rara. Wellcome II, p. 28. â€˜First expression of the differential hydrodynamic equations in terms of a field and of the hydrodynamic paradox. Dâ€™Alembertâ€™s essay was an important work in fluid mechanics, ranking him among Clairaut, Bernoulli and Euler in development of this fieldâ€™. , 1752. 1752. RHODE ISLAND. Acts and Laws of His Majesty's Colony of Rhode-Island, and Providence Plantations, in New-England, in America. From Anno 1745, to Anno 1752. Newport: J. Franklin, 1752. Fol. 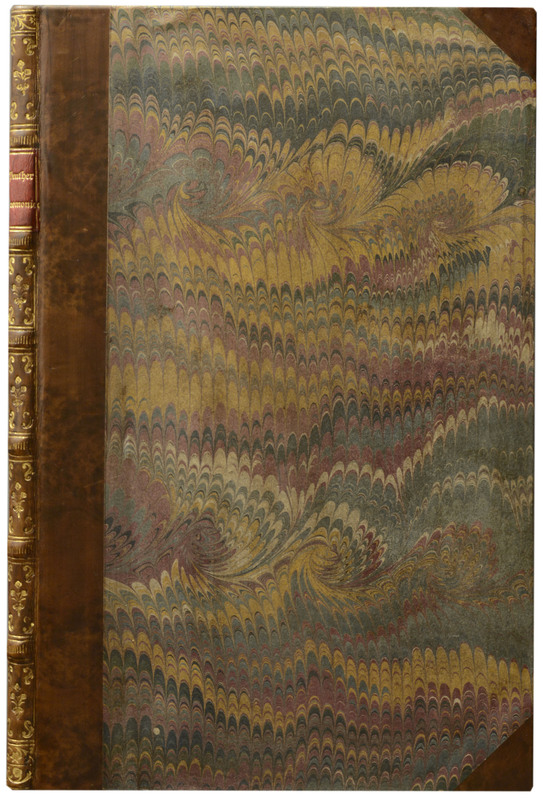 , 110 p. Contemporary marbled paper wrappers, recently bound in lovely full calf, antique. A fine, fresh copy inside and out. 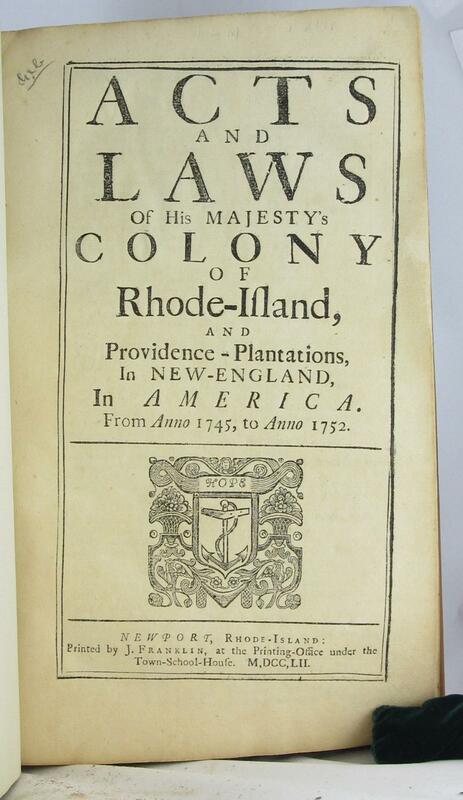 Laws of the Rhode Island colony from 1745 through 1752, being a continuation of the compilation of 1745. The printer was Benjamin Franklin's nephew, James Franklin, Jun. Alden 128, Evans 6919.
, 1752. 1752. NEW JERSEY. LAWS. The Acts of the General Assembly of the Province of New- Jersey, from the Time of the Surrender of the Government ... to this Present Time ... By Samuel Nevill.... [Philadelphia]: William Bradford, 1752. Sm. fol. , 507 p. [with:] The Acts of the General Assembly of the Province of New-Jersey, from the Year 1753 ... where the first volume ends, to the Year 1761 ... By Samuel Nevill ... Volume the Second. Woodbridge: James Parker, 1761. Sm. fol. , x, , 368, , 369-401, , 56, 64 p. Contemporary sheep (v.1) and contemporary reversed sheep (v.2), both very skillfully rebacked in period style. First two leaves of v.1 neatly guarded in the blank margins, the usual foxing and browning common to early American paper, else an unusually nice set in contemporary bindings. 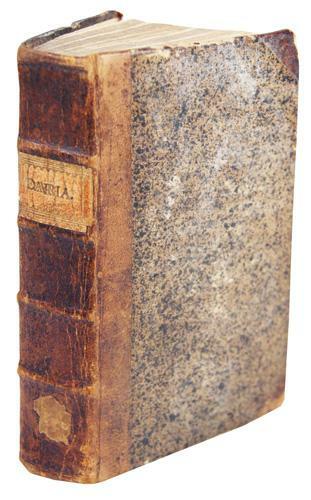 The second compilation of the laws of New Jersey (following that of John Kinsey in 1732), assembled by Samuel Nevill with the assistance in the first volume of Philip Kearny. The second volume is the first law compilation to be printed in New Jersey, James Parker having set up the colony's first permanent printing press at Woodbridge in 1754. For a detailed study of the evolution and printing of Nevill's Laws, see Felcone, New Jersey Books, 155 and 157, and Printing in New Jersey, 1754- 1800, 59. Evans 6893, 8680, 8947; ESTC W14077, W14078.